Joan Evers knows a lot about history, but the fifth generation Edwardsvillian is particularly well-versed on the historic Wildey Theatre’s past. Evers says it is “in her blood.” You see that is because Evers was born the daughter of Ed and Cleo Foehrkalb. At one time or another, her uncles, Andy and Henry, served as managers at the Wildey, and her father, along with owning and operating a print shop and a retail store in downtown Edwardsville, also served as the Wildey’s projectionist for more than 40 years, part-time and full-time during World War II. As a young boy, she said her father followed his two older brothers around town, Andy and Henry. From helping uncle Andy, a projectionist, rewind films in Nickelodeons, to unloading box cars for the acts and sweeping up at the Wildey when Andy was a projectionist there, he fell in love with the theatre. Evers said Andy and Henry also managed other theatres in the area including the Majestic in East St. Louis. She said the Wildey was part of a chain, and you may have moved around as a manager. She said her father stayed in town as a projectionist, plus he had other businesses to tend to. Because of her family, Joan Evers spent a considerable amount of time during her childhood in the Wildey, and even during her adulthood. In addition, Evers has a massive collection of memorabilia, such as pictures (including an autographed photo of Al Jolson who performed at the Wildey), original chairs, bulletins, flyers, advertising materials, give-aways to get people to come back for a coming attraction, and much more from the theatre’s past. She credits her parents for keeping a lot of the items, many of which her father printed in his print shop. “They loved history,” Evers said. Evers got both her love of history and theatre from them. She even took her love of theatre to the University of Southern California in the 1950s to earn a degree in production, radio and television. Evers said her decision to pursue her dreams in Los Angeles came from her love of the Wildey. From seeing movie actors on the streets to working at CBS, Evers said it was great to be there, and be part of the industry. In fact, Evers said she was not the only one inspired by the Wildey. Eddie Dunstedter, a piano player during the silent films there, went on to Hollywood to become a music conductor. Evers herself eventually returned to Edwardsville. She worked in her parents retail shop, and married Kenneth Evers, now the late mayor of the city, and worked for more than 40-plus years at Florists’ Mutual and retired as a vice-president. Earlier this week, Evers shared some of her knowledge about how the theatre started as an Opera House in 1909, and moved from theatre acts and silent films to a place for films in the 1930s before closing its doors officially in 1984. Evers said it all started when the I.O.O.F. wanted to construct a new building to replace its existing building on Second Street. She said they owned the land there on Main, so it made sense to build it at that location. “They sold shares at $25 per piece in order to finance the project,” Evers said. Evers said the building was named after Thomas Wildey the founder of the I.O.O.F. in the United States, though she said many confuse that with the founder for the organization started in Europe. “He brought it here,” she said. She said the building originally had three floors: the theatre on the first floor, a place for parties and dances on the second (a place where she took ballet and tap as a child in the 1940s), and a meeting room for the I.O.O.F. on the third. At this time, Evers said the theatre had a seating capacity of 1,150 – about 500 on the main floor, 300 in the first balcony and 300 in the upper balcony. Evers said the stage was also one of the largest south of Chicago at 61 feet by 35 feet and 65 feet tall, and it had 40 scenic curtains. She said because of its extensive seating capacity, it was popular for small and large acts. Acts included: line theatres, musicals, amateurs and more. Evers said the theatre did not run continuously, like the Fox Theatre today, it had shows intermittently. “By 1912, the Wildey had become a home for vaudeville or theatre type acts on their way to and from St. Louis,” Evers said. Three years later, Evers said the Wildey saw its biggest crowd ever for a patriotic event honoring the young local doughboys, those who would be leaving the following day for the Great War. “One thousand are left to stand outside while an overcapacity crowd jams the inside,” she said. After the war, Evers said many theatres changed their format, and went to burlesque. “The Wildey never did that,” Evers said. Evers said they stuck with vaudeville and silent films. However, she said before vaudeville was the draw, and now it was the silent films. In 1921, Evers said the theatre installed new projectors and had continuously running films – now the projectionist did not have to change reels during the films. 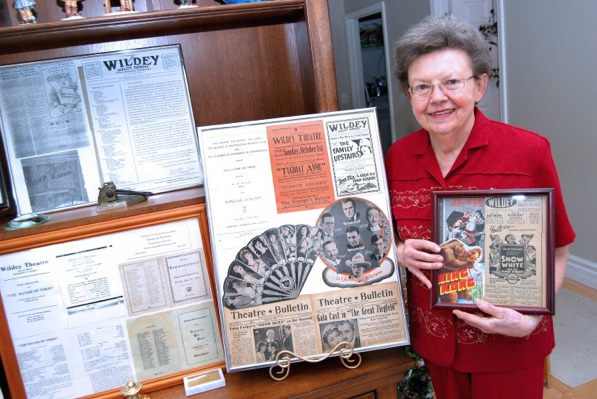 She said the Wildey’s competitor down the street also closed – the O G Theatre. Evers said the Edwardsville High School conducted its last graduation at the theatre in 1924 as it constructed a new high school, now Lincoln Middle School. She said her mother was in that class. Then, by the mid-1920s, the theatre under went its first renovation. Evers said it opened under the management of Uncle Andy. She said the Wildey got a Gratian Organ and super-ventilating and cooling system. Evers said the organist would play music to accompany the films, but some films were later produced with complete musical scores on phonograph records. She said the sound would not always be on target with the films, as the film would break, or the movement created by the vehicles traveling on Main Street would disrupt the needle on the record. By the 1930s, like theatres across the county, the Wildey was rewired for sound. Evers said the theatre under went another renovation in 1936. During this one, she said the sideboxes and second balcony were removed, the projection booth was moved higher into the center area, and again the theatre got new equipment, and the lobby was expanded and given an art-deco look (what the city has selected to return the theatre to now). She said it reopened in 1937 with Uncle Henry as the manager. During this renovation, Evers said her father saved some items that were tossed including a few of the vases that were located in the boxes and some of the original wicker chairs. She said the workers just tossed the vases to the floor and the crushed pieces were swept up. “I have one in its original condition, and one we had SIUE restore to its original state,” she said. Now, Evers said she is awaiting the Wildey Theatre’s reopening on April 12, 2011. “My dad was only person there who was there when the Wildey closed and when it opened,” Evers said. Evers said she has watched the theatre renovation process over the last year and has helped with fundraisers for the Friends of the Wildey. “I am excited to see the Wildey come back,” Evers said.